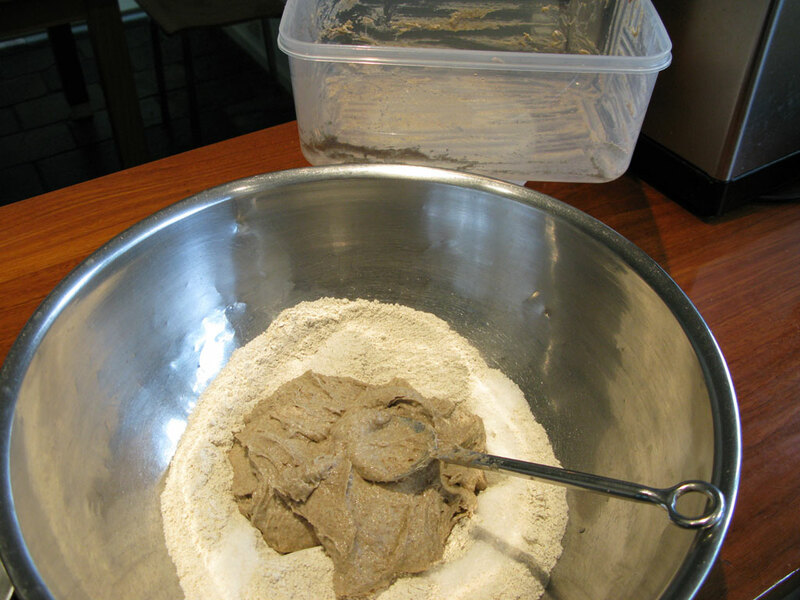 The final stage in making your rye sourdough bread is the bread dough itself. 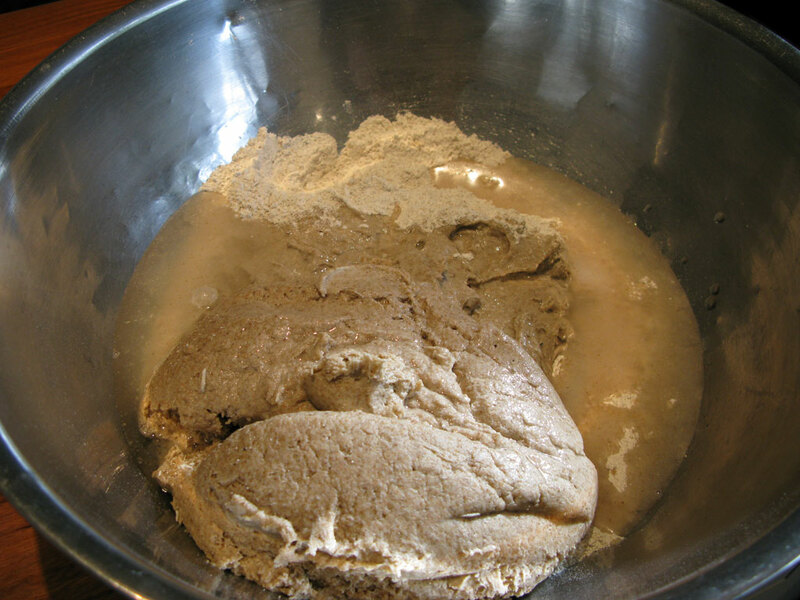 The bread dough is the final dough which will be proved, baked and eaten with relish and gusto. Your sourdough is made using your starter. Your bread dough is made using your sourdough. Remove your original starter from the sourdough and store it in your usual way – in the fridge is the best as you keep it there for up to several weeks without having to tend it. The recipe should include an excess of sourdough by the exact amount of the original starter. This way your starter is nicely recycled at the same time as you make your bread. Put your starter’s container on the scales and zero out the scale. Then fill a jug with filtered water to use both for the bread dough and to dip your spoon into when extracting the starter from the sourdough. With a wet spoon remove the same amount of the sourdough as starter was originally added to it. 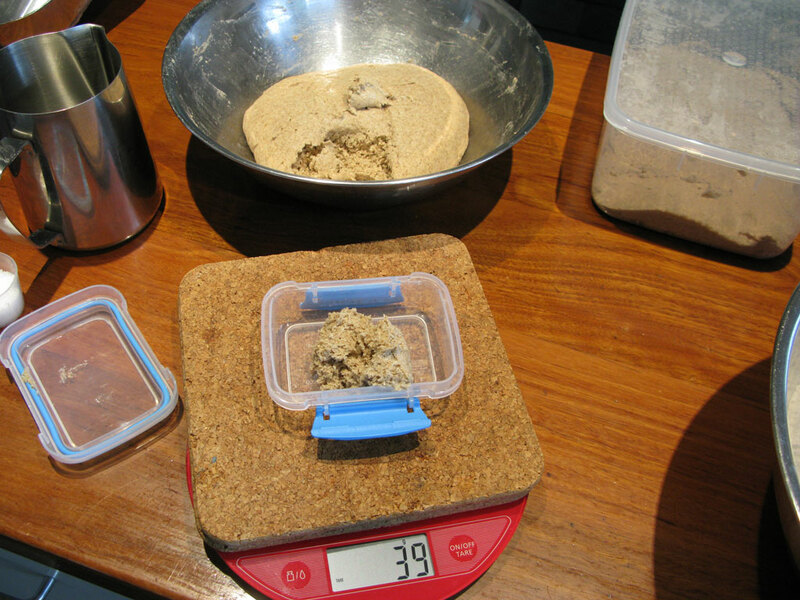 Thus, if your sourdough had 200g (7.055oz) of starter then you need to remove 200g from the sourdough. Store it in your starter’s container and in your fridge (preferably at the bottom where the temperature is more likely to remain cool and constant). This will be your starter for your next batch of bread. It is best to keep your rye starter separate from your wheat starter as some people who are sensitive to gluten can handle rye bread so the less wheat the better. If you are using an electronic scale then progressively add the flour ingredients, zeroing the scale after adding each ingredient. Alternatively, you can use the cumulative weights of ingredients given in the recipe to continuously add to the mix. For balance type scales it is definitely easier to use the cumulative weights. Tip: When adding multiple flours, gently flatten the previously added ingredients in the scale dish and add the next ingredient as a new mound – this makes it easier to remove excess flour that may have accidentally slipped onto the scale dish. Put the weighed ingredients into a mixing bowl large enough to hold the whole recipe’s ingredients (stainless steel bowls are preferable). 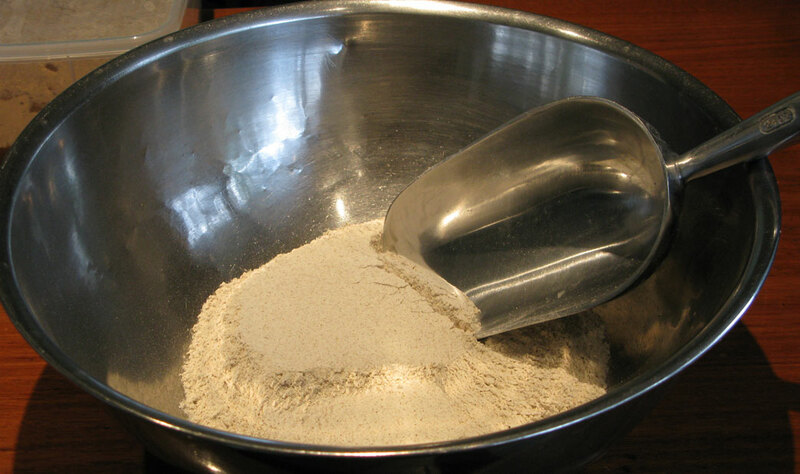 Using your flour scoop or scraper make a large crater in the flour, being careful not to push it over the sides. Tip: If you are planning to make your bread dough early in the morning, then it pays to prepare your kitchen the night before. This includes weighing the dry ingredients (if diastatic malt is used in the recipe then keep in a separate container) into the planned mixing bowl. Weigh out the required amount of salt and add to the flour. If your recipe has a soaker then add this to the centre of the crater. Do not mix the ingredients at this time. Using your scraper, remove the remaining sourdough from its fermentation container and carefully add it to the crater. Ensure that you wet the scraper before using it as this will prevent the sourdough sticking. 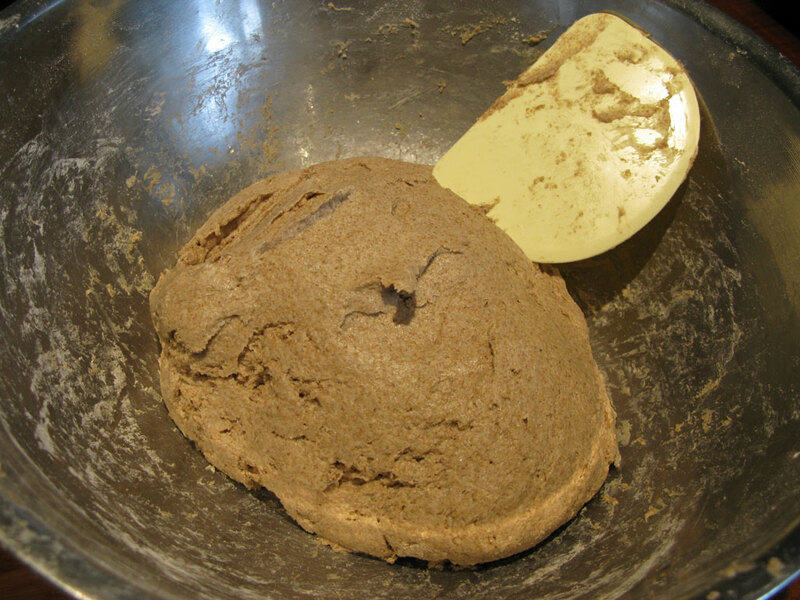 Alternatively use the flour in the bowl to rub off the sourdough stuck to the scraper or container. This will rub off quite easily, add more flour if it starts to get sticky again. Weigh out the required water ingredient. Pour the water into the flour crater. Be careful not to swish it over the lip of the bowl – a common accident that can result in the wrong amount of water entering the mix. 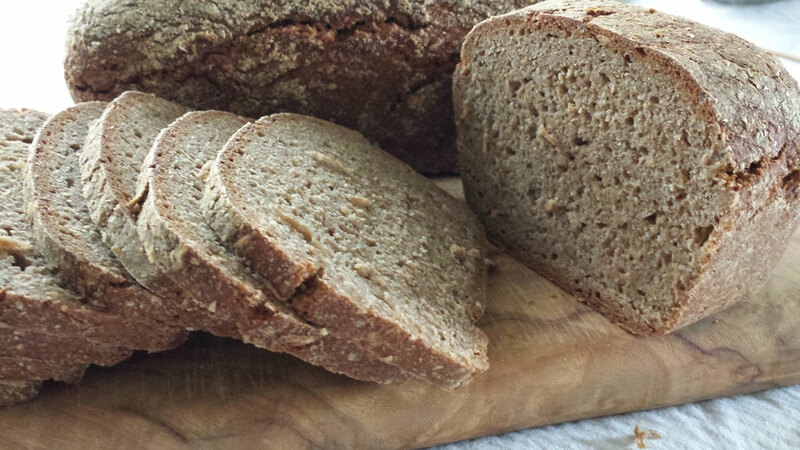 Most rye bread recipes will show the Target Temperature to be 27°C (80°F). To get such a high dough temperature the trick is to add warm water. The colder the room temperature the warmer the water, it should never be boiling however. Using your strong hand and the scraper blend the ingredients together, hydrating the flour and absorbing the water. It’s best to get the water gently absorbed into the flour as soon as possible to prevent the water squirting out or spilling when you start to work the dough with your hand. Once the water is absorbed, use your hand to fully blend and hydrate all the ingredients, being careful not to spill the mix. Reach to the bottom of the bowl to ensure the dry flour at the bottom is mixed in. If your recipe includes dried fruit and/or nuts which are not soaked then carefully mix the fruit and nuts through using your hand to evenly distribute, be careful not to break the fruit. Leave the dough in a location in your house that has a constant temperature away from draughts – preferably 20°C (68°F), covered by a tea towel for the period of the bulk fermentation time set in the recipe. 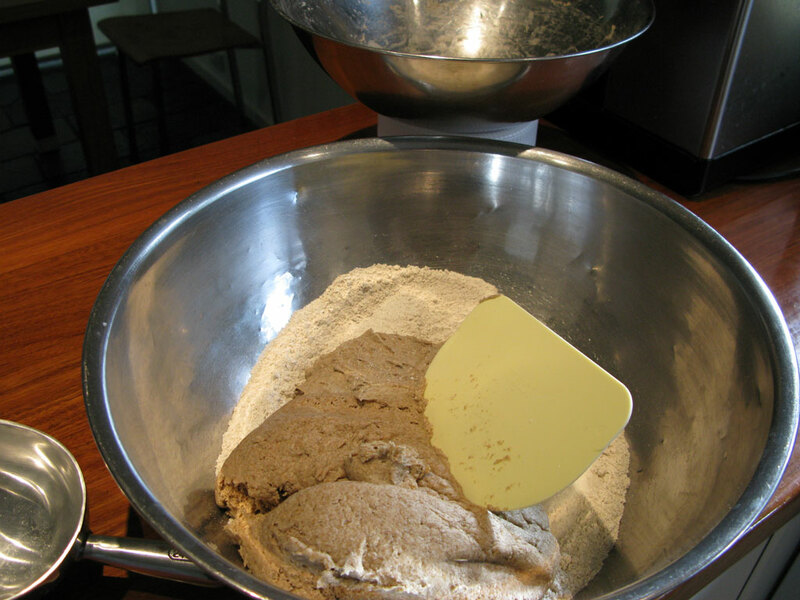 Have available a small bowl of water to keep your hands wet, this helps you work with the dough. Tip the dough on to the bench and if you have a dough cutter use this to add the weight of the bread that you are making to the scale. You can moisten the container on the scale with water so that the dough doesn’t stick. If you are making two 900g(31.75oz) loaves then add this amount to the scale. Place to one side and do the same with the second loaf. The left over amount is cut in two and added to each loaf. Using wet hands mold the dough to fit the tin you are using. Roll it in rye meal or rye flour and place it in the tin. Leave the dough in a location in your house that has a constant temperature away from draughts – preferably 20°C (68°F) for the period of the final proof time set in the recipe. 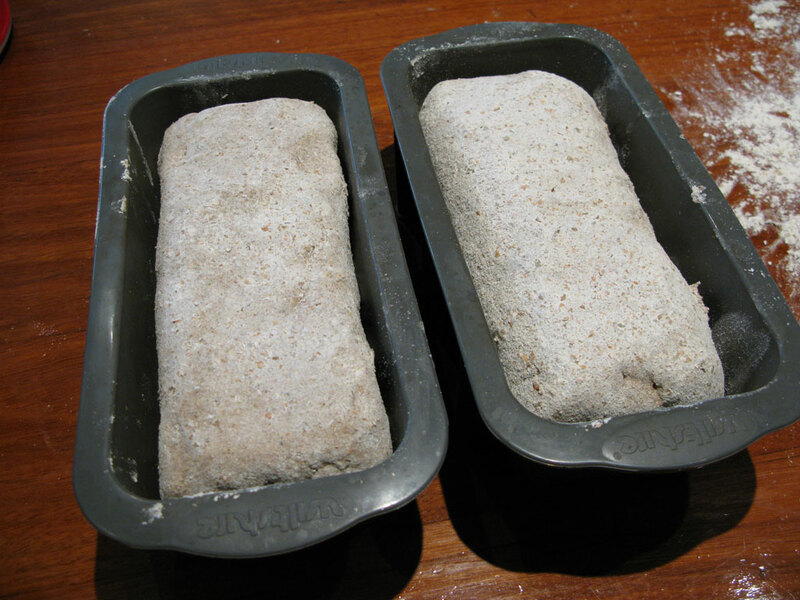 Step 11 – Bake your bread. Preheat your oven to 210°C (410°F). No slashing is required. Place the tins or silicon containers into the oven on top of your stone. You may lightly spray the dough with water. Pour boiling water into the stainless bowl to generate steam. Change the oven temperature to 190°C (374°F) and leave the bread to bake for 1 and a half hours. The bread is baked when you get a good resonance or hollow sound when you drum the bottom of the loaf with your fingers (be careful not to burn yourself).